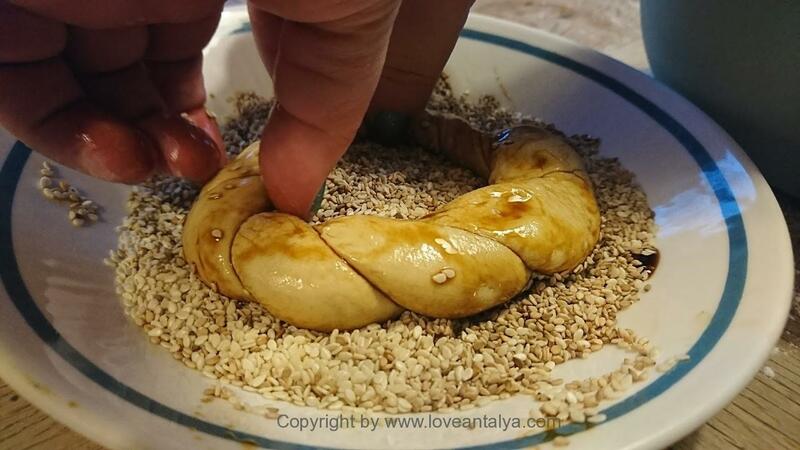 Home » English » Turkish Simit – can bread be exotic? 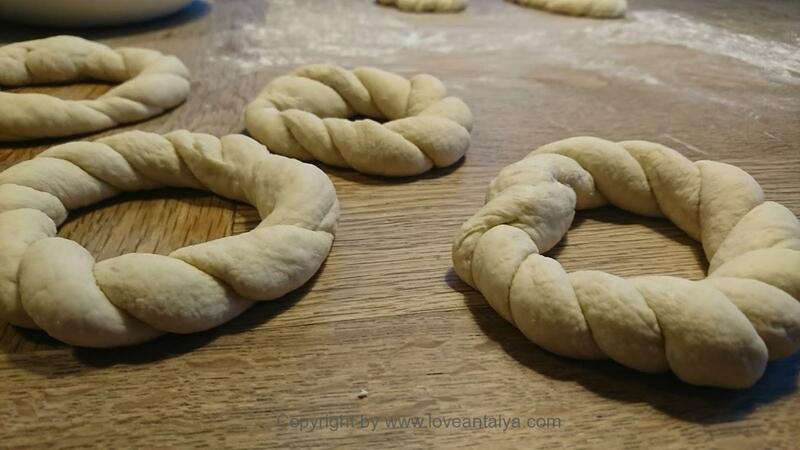 Turkish simit – just the word sounds a bit exotic right ?? And in a way, it’s true. Simit is at least one type of bread, we do not know at home. And it tastes good – really good !! Since it’s a bit of a hazzle to get it, I tried to make it myself. It turns out, that it wasn’t that difficult. 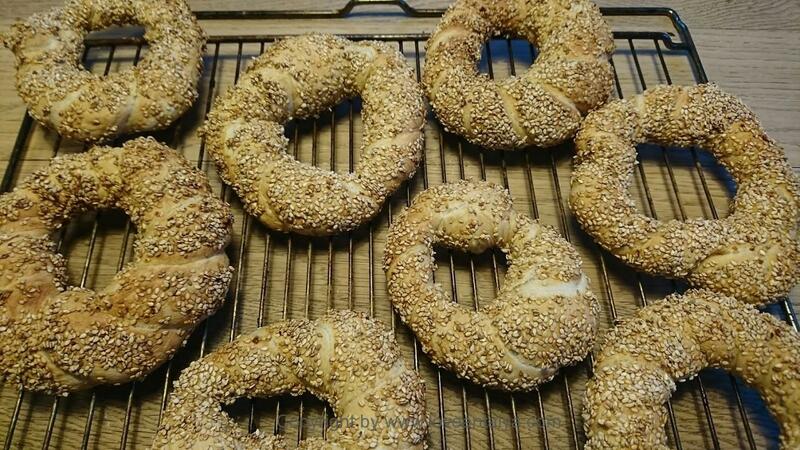 You may know Simit as the bread-ring covered in sesame seeds, which is sold from the streets anywhere in Turkey. A little remarkable that the salesmen walk around with a huge dish on their head, with bread-rings arranged in a beautiful pattern and shouts like any other seller. This is typically Turkish in my eyes (and rather exotic too). Perhaps the sellers aren’t that common anymore. At least i haven’t seen them for a while. It would be a shame if this isn’t practised anymore, because it was so cozy and full of atmosphere, when they walked around shouting. Now I am perhaps s bit nostalgic. It is probably linked to one of my first summers in Antalya for too many years ago, when my husband (then boyfriend) and I had borrowed his parents’ apartment in the city. There we awoke each morning by hearing someone shouting – almost chanting and rhythmic. He was there several times a day from early morning to late evening. Sometimes we sped down the stairs and bought the hot, freshly baked Simit from him, gave him a little extra tip for his tenacity. Sometimes he put a couple of freshly baked bread for us on the stairs. And they were always really delicious and tasty. Why is turkish Simit so delicious? 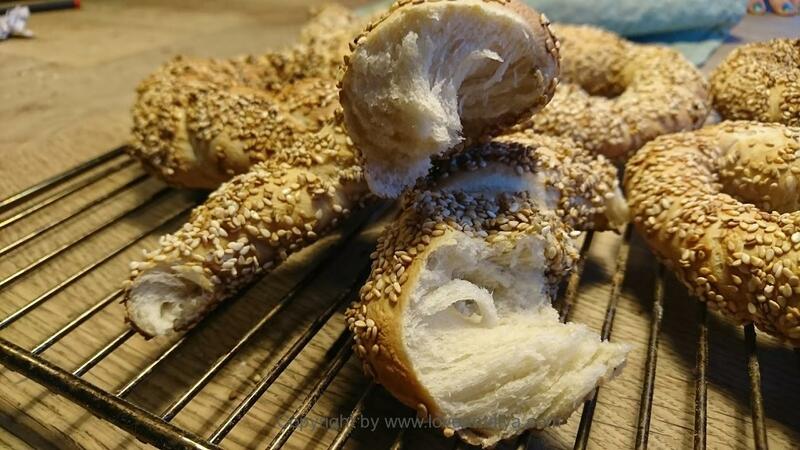 When I posted the images on a Turkish food community on Facebook, there were so many who likede them – perhaps a testament to how popular and loved these breads are ?? 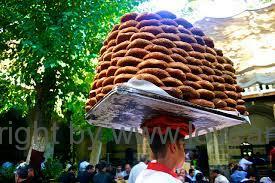 The people I know, who have been to Turkey, simply love Simit. And they are also quite easy to love with their chewy crust covered in sesame seeds, soft inside and lightly salted taste. And they can fit to almost everything (but I’m particularly fond of them, along with soup). Stir yeast with a bit of water + sugar (½ teaspoon). Everything else is mixed in and stir. I usually use my Kitchenaid mixer and set it at step 4 for approximately 10 minutes. The more you stir / knead, the airier and less dense bread you get. Let it rise until doubled in siz. It will take about 2 hours in a cool place. Take out the baking sheets. 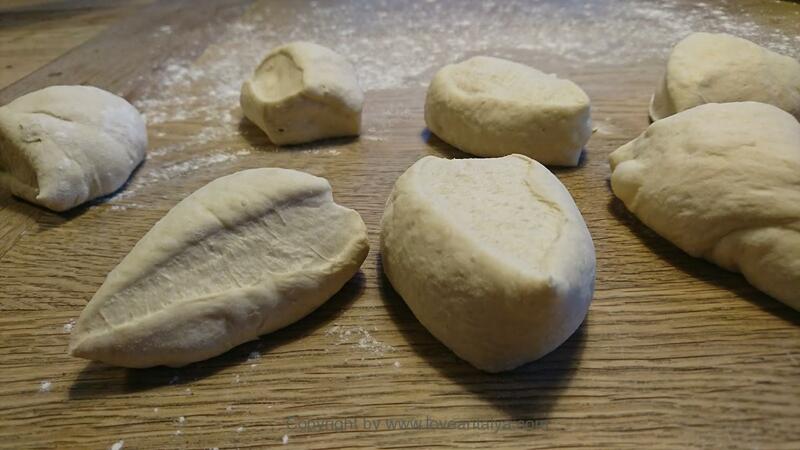 Divide the dough into 10 equal pieces. Roll each piece out into a long sausage of about 70 cm. Fold it lightly in half, hold on the middle with two fingers and twist the ends around each other to resemble a braid. 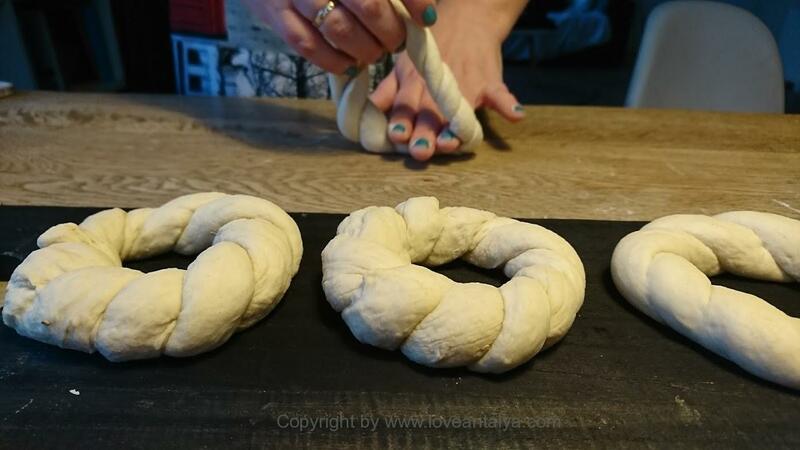 Twist or turn the dough around itself, while you fasten the ends securely together. There must be a “hole” in the middle of about 5-7 cm wide. It sounds a little tricky, but it really isn’t. Just imagine that it must be a nice twisted ring with a hole in the middle. Of course you can also choose just not to twist them, but then they will lack a bit of the original charm, I think. Now you can mix pekmez and water together in a medium deep bowl. Fill the sesame seeds in a shallow dish. Dip the rings in the syrup-mixture and roll them afterwards in sesame seeds. They must be completely covered with syrup and seeds all over. Heat the oven to 200º. Let the rings rest on the baking sheets for about 20 minutes. Set 5 rings on each plate. Put them into the oven and let them bake for about 15 minutes. Baking time can vary slightly depending on the oven. Keep an eye on them, as they should neither be too dark or hard. Take them out, when they are golden and sounds hollow and let them cool on a rack. 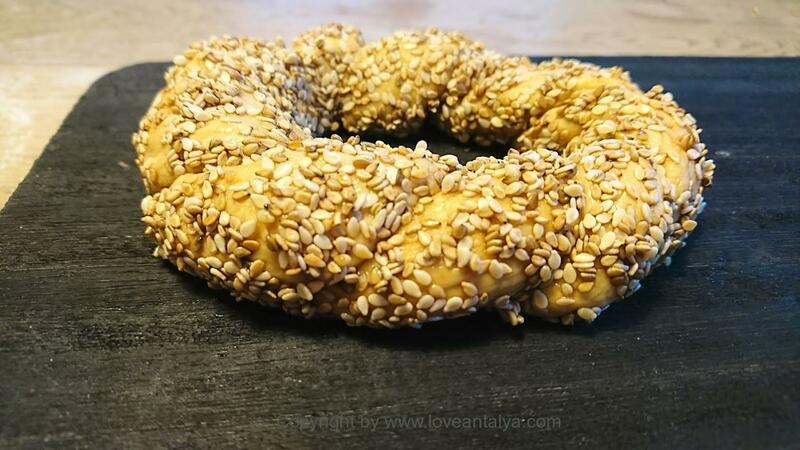 Simit is best the same day and suitable for everything from breakfast, soup, salad, for dinner or just as a small snack. « All-inclusive – om at overvinde sig selv og prøve noget nyt.